Confessions of a Bad, Ugly Singer is available for pre-sale in the UK!!! “Confessions of a Bad, Ugly Singer” went on pre-sale today in the UK!!! It is available at Waterstone Books and if you would consider buying it I will name my first newborn or next cat after you. Thank you to those who stood by me during such a fucked up time!!! Thank you to Jeff Schmidt from NY Creative, Teddie Dahlin from New Haven Publishing and Bruce Caines for a BOMB cover photo!!! See y’all on the flipside. In April of 2014, former edibleRed vocalist Collette McLafferty had the shock of her life when a gig in a P!NK cover band dragged her into a $10,000,000 lawsuit. The Plaintiff, a personal injury attorney who once played drums for Michael Bolton, had a dispute with her band leader claiming he stole the lawyer’s idea to start Long Island’s first P!NK cover band. Although she had never met the attorney and was only a “hired gun” in the group, McLafferty found herself named in the 112-page complaint. Stunned to learn she could be in a years-long court battle for singing “Raise Your Glass” at a Long Island Bar, Collette made the difficult decision to take her case to the press. She made a late night phone call to The New York Post in hopes of leaving a message. To her surprise, a copy boy was eating lunch at the Tip Desk during the graveyard shift. Sympathetic to her situation, he knew he had a big story on his hands and promised to pitch it the next morning. Although the dispute was mostly between the two men, Collette woke up to the headline “Singer Sued for Being Too Old and Too Ugly for P!NK Cover band” in the paper. The sensationalized headline told a story of a singer who was so “old, ugly and untalented” that her one-night performance prompted the lawyer to sue. This “fake news” version of events went viral worldwide, garnering coverage in Time, Yahoo News and Breitbart. The former MTV “Buzzworthy” artist was dismayed to see her online reputation unceremoniously destroyed as highlights from her 20-year professional history were suddenly buried under pages of career-ending click bait. The headlines alleged she”ruined” the P!NK cover band with her inferior looks and singing, triggering a deep depression. Determined to find justice, McLafferty fought the case and eventually introduced “Collette’s Law” with the help of The Lawsuit Reform Alliance of New York and Assemblyman Luis Sepulveda. 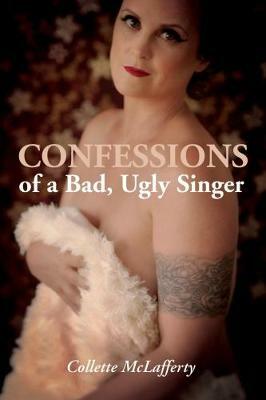 “Confessions of a Bad, Ugly Singer” documents the emotional two-year journey of navigating the legal system, while embarking on a quest to clear her name.